In this video you can see a Russian tank in Vuhlehirsk shooting at a 9 level-residential building. A Russian 'reporter' tells some story about Right Sector bla bla and snipers or so. No fighting is going on. Nobody fires back. As can be seen they are in safe area, surrounded by the quarters of Vuhlehirsk. They drive AWAY from the frontline, NOT TOWARDS the frontline. Furthermore, NO fighting or firing is going on. The reporter ducks his head all the time, but that is just for show. When they enter the building NO Ukrainian soldiers were found hiding out there. The Russians shoot with a tank on Ukrainian apartment buildings while there is NO military threat, just for fun and to make some good Russian tv. Such kind of senseless destruction against civilians property is a war crime. It is very well possible that civilians may have got killed or wounded because of this. The people are waiting in line to go into the direction THEY CAME FROM!!! Furthermore... there are not very many people!! I counted 37 dots (dog included)! 31 people and there is only ONE yellow bus. 26 people in the shot from the other side. So lets take a really big margin and say there were 150 people. This is a KILOMETERS long row of waiting cars on the road from Donetsk to to Kurakhovo on January 20th. 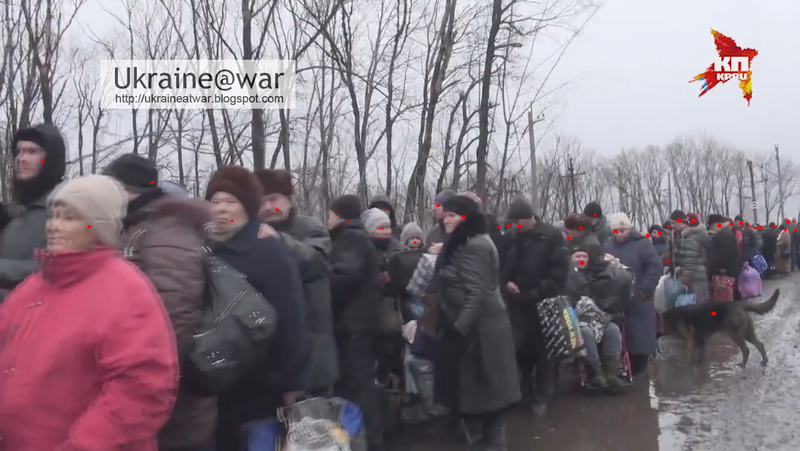 THAT's how many civilians are fleeing from the horrors that Russia brings over their land! So what about these 150? When you don't have gas or electricity or water or bread to eat and you can get a couple of rubles and a bus ticket out of the war zone... some people do this. They don't care about what's will be done with the footage. They only try to survive.